Our new kitchen faucet could not have been a better deal. We snagged it on ebay (at our contractor’s suggestion) for an unbelievable $200+ below retail. We’re at the fun stage of the kitchen renovation where we get to choose hardware, fixtures and faucets- but the fun part can add up quickly so we’ll take all the budget saving discounts that we can get. Check out our brand new $71 (!!!) 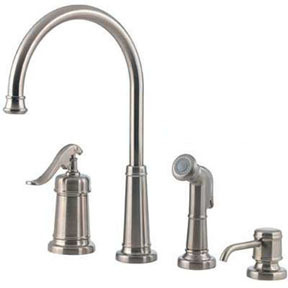 Price Pfister brushed nickel faucet (which also includes a handy dandy sprayer for Burger baths and a cute undermount soap dispenser). Can’t wait to see how it looks with our granite countertop and undermount sink. And so glad we didn’t pay full price. Thank You so much for your advice about Ebay! I just bought a faucet like yours but chrome for my remodel project for $51.00. Thanks also for your other money saving tips on here. Its been helping me out alot. Heck yea! I love Tuesday Morning! Thanks for sharing this information. It will save me a lot. Keep going on!